India and Australia share one of the fiercest rivalries in the cricket world. One can always expect fireworks when these two teams play each other. Since the turn of the decade, the rivalry between India and Australia has out-shone any other battle, both on and off the field. Every India-Australia series usually garners a lot of interest, irrespective of the format and is one of the most watched battles across the globe. Even though the head-to-head record is tilted heavily towards Australia, there have been some memorable ODI matches. With India and Australia expected to play a fiery 5-match ODI series in a few days, let’s look at the top 5 ODI encounters between these two cricketing giants. This was a game that most Indians are proud of even though they were on the losing side. In an all-important group encounter, India were battling Aussies and the result was going to decide the finalists. Australia had already qualified for the finals and a win would have sealed the berth for India. 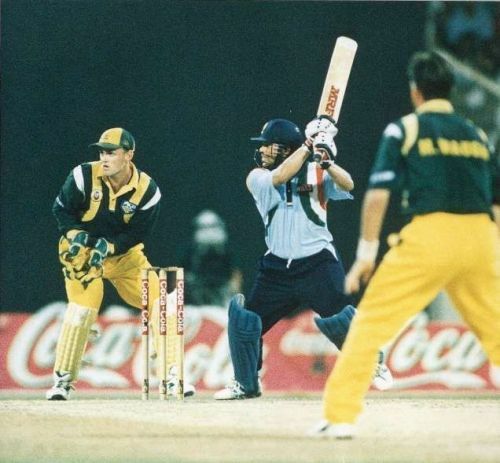 With the help of a brilliant hundred from Michael Bevan (101 not out) and a controlled 81 from Mark Waugh ensured Australia got to 284 at the end of 50 overs. India needed to score at least 254 to qualify for the finals on net run-rate. As it was often the case those days, India heavily depended on Sachin to score big and he didn’t disappoint. He was slowly taking India to that qualification mark before a desert storm interrupted the game with India 143-4 in 31 overs. When the players were back on the field, India’s task became tougher as the target was revised to 276 in 46 overs, but more importantly, India needed 237 to qualify for the final. What followed after the desert storm was absolute magic. Tendulkar decided to tear apart Australia's bowling attack as India scored almost 100 runs in the next 11 overs with the master doing the bulk of the scoring, helping India overhaul the required qualifying target quite easily. And when he got out in the 43rd over as he was trying to go for the win, he had scored a scintillating 143 off 131 balls (9 fours and 5 sixes). Though India didn’t win, Sachin’s knock was one of the greatest ever in an ODI and now everyone remembers it by the name ‘Desert Storm’.